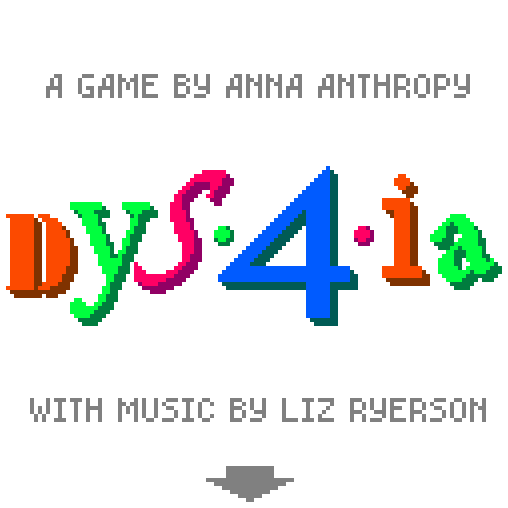 It's called Dys4ia and, basically, it takes you through transgender game developer Anna Anthropy's rather tumultuous experiences with hormone replacement therapy. I'm sure some will say it's not really a game, at least not in the traditional sense. My response to that: Anthropy's not exactly a traditional game developer, so what did you expect? Anyway, I quite enjoyed my brief playthrough of Anthropy's latest Flash-based effort. I'm sure this will sound awfully odd, but it's kind of like an extremely linear WarioWare game, as each segment has you complete a (generally easy) task while reading a small bit of on-screen text. Although such gameplay--if it can be called that--could be be boring in the wrong hands, in Anthropy's hands it's surprisingly compelling. Of course, it helps that she keeps things interesting by rarely calling on the player to complete the same "task" more than once. As for Dys4ia's superficial aspects: Its pixel-based graphics are, as is seemingly always the case in an auntie pixelante game, superb, as is Liz Ryerson's spacey, new-age-ish soundtrack. It only takes a few minutes to complete a single run-through of Dys4ia, so if you have the time and interest I'd highly recommend giving it a go (here) as soon as possible. THis is beautiful, and I feel like I need to recommend it to all my friends ho deal with this--which, I'll admit, aren't many, but still. It's lovely. Hey, I don't think you need to limit your recommendations to those who have had to deal with this, Justin. After all, you found it touching, right? And so did I. I think anyone could "play" it and it "enjoy" it or learn from it. I'd really love to hear what other people think about this game. Like I said in this post, I have a feeling some folks will absolutely despise it, call it a non-game, etc. Still, I'd like to hear their thoughts -- esp. as those thoughts relate to why they don't like the game.